by Jesus PresleyI wrote about Melt05, Melt06 and Melt07 and in the first years I had the feeling to be one lonely chronist of this special festival, the last two years there has been an impressive coverage from press and blog, so this time I am only telling my own story and link to others to round everything up. It has been the biggest Melt! 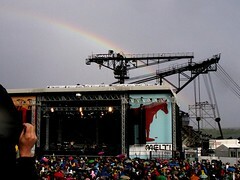 festival so far with more than 20 000 visitors and three days of packed stages from rock to techno from bands to Djs. And things that grow hurt sometimes. It’s not easy to maintain the magic of a small festival with special bands if more and more people want to come and see it. It’s a big tease and a big challenge to let it grow, organize three days instead of two and produce a big show like the one Björk did on the last day, sunday. by Jesus PresleyAnd it is a big responsibility not to spoil it over the ambition. So, many people were dissapointed by the organization, by the fact of having to wait so long to finally get in, to miss bands because venues were full or because schedules were changed or bands cancelled their gigs. And the heavy rain on the first day did not help at all either. But, there were so many great concerts! Like the dubstep parties with Caspah, Skream and, yes, Goldie (see picture above..), like cool and beautiful gigs by GusGus and Björk or the Battles (such crude music and such a warm audience) and over all to see so many beautiful and nice people from all over Europe having so much fun together. Mainstage , Rrrauschenlauschen: melt-2008-samstag-190708-fazit, Mocca-couture: Melt-2008, Fortschritt TV: Melt 2008 Review, Extrablau: Drei Tage krwach – wir feiern, Indiestreber: melt-2008-tut-mir-leid-wenn-ich-sage-fruher-war-alles-besser-aber-fruher-war-alles-besser/, Direkteingabe: Melt Erfahrungsbericht, Xdev: Melt 08 Festival, Plaiboi Melt Rückblick, Sonett 77, Sander S: Melt in Retrospect, Topfives: Besser schmelzen, Torsun: Die Stirn, Jetzt.de: Wir wollten unser letztes Melt.., Parkplatz Rave aufm Melt. Especially in the Melt-Forum you can read a wide discussion about what went wrong and what should change next year. The nice thing about it is that many fans utter their discontent very openly but that the discussion never gets out of hands. If criticism is too harsh or exaggerated, there will instantly be discussion members who would soften things up to a serious level. by Jesus PresleySo, getting to my own story: Actually, one of the dissapointments I could have prevented myself: Hercules and Love Affair were present on the festival, only the crew was still on their way from Berlin and would not have made it in time. But none of us had the idea to let the band play accoustic or in any other way to with the help of th festival crew! Why? I don’t know. And things got so hectic that I did not get on stage to tell the audience that Alter Ego were going to play instead. Afterwards I did, but that was definitely too late. Bugger. I had not expected this and was not sharpminded enough to make the right decisions. Apart from that, “my” stage, the Gemini stage was great. Mr Oizo rocked, distorted massively but he and the crowd had a good time. Feadz lost a Flat Eric toy but got it back, thanks to the note we printed out which you can see here. the whole Get physical crew (Booka Shade and M.A.N.D.Y.) did a good job and people danced on the wooden floor. That thing, by the way was tricky: If you just stood still, it swung so hard, it made you dance automatically! Sunday I was also responsible for the Gemini stage which organized itself more or less: Berlin Battery rocked several hours and did a great closing show for this years Melt! I’ll post a video later in which you can see that despite all the justified criticism this year’s Melt cannot have been so bad! So, I’ll be there next year, too, with more whit and preparation and so will everybody else who organizes this, in my eyes, still Germany’s greatest festival.